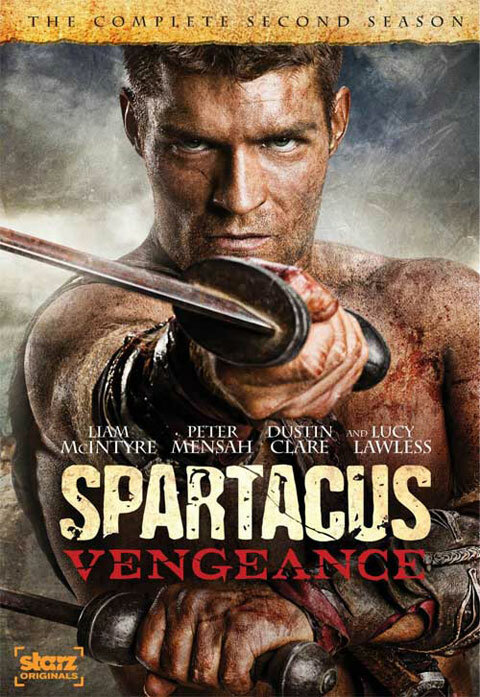 Spartacus: Vengeance is about as unclean and as unwholesome as television can possibly get. Set in period with a different moral code, and featuring individuals who deviate from even those morals, Vengeance is a story of slavery and uprising, power plays and the people that are worth placing trust in. It’s not all savory to watch, but it’s meant to push the boundaries of acceptable content, and one thing is guaranteed: even in the show’s most vile plotlines and ludicrous moments, audiences won’t be able to tear their eyes from the screen. Spartacus: Vengeance is the second season of Starz’s hit show, but elements from the prequel Spartacus: Gods of the Arena also come into play and occasionally cause strife in the new episodes. Because the death count is always so high in the series, I don’t want to get into details about what the new season brings us, but I will say Spartacus has capably taken on the role of a rebel leader prepared to take down any Romans that get in the way of his and his newfound army’s freedom. As in the past, fighting takes precedence in the series, but there’s a new attitude that comes with survival outside of the arena and a different kind of toughness present in Vengeance too, found in the season’s emboldened speeches and crisis mentalities that come with fighting a war. It is in these scenes that Liam McIntyre’s Spartacus truly comes into his own. McIntyre had a lot to live up to after taking over for Andy Whitfield (who played the character prior to tragically succumbing to non-Hodgkin lymphoma) going into the season, but he proves he is pretty capable early on, potentially because we are seeing a different side to Spartacus than we saw in Spartacus: Blood and Sand. Additionally, the disc devotes an entire segment, “On the Set with Liam McIntyre,” to meeting the new guy, and it's clear he figured out the role pretty quickly. The visual effects in Vengeance are also striking and there are a few scenes that really take the look of the show to a whole new level. One of the bonus features with the set “Burning Down The House: The VFX of Episode 205” discusses how the look of the program was initially going to be low tech, but once there was more creative pressure to stress visuals, the effects guys began to figure out how they could pull off a more impressive looking picture. To explain many of the changes from season to season, the arena fight scene and subsequent burning are explained in detail. The amount of CG work in just that one scene is incredible—as the show grows up, the look does, too. Still, the ridiculous blood spatter shots make their way into the new season and Vengeance is still a boy’s arena with the men’s causes given precedence. This isn’t to say there aren’t a few strong female characters; the Roman lovers of intrigue Lucretia (Lucy Lawless) and Ilithyia (Viva Bianca), as well as the rebel Mira (Katrina Law) put in strong showings throughout the season. True, too, is the fact the entire series has been pushing toward a gruesome and violent war; however, we are talking more breasts and sexual exploitation and more torture scenes than we are talking battle-specific violence. The very nature of the show is one of excess, and between the breasts and the multitude of swords cutting through throats and in to abdomens, it is geared to a very specific audience. Spartacus: Vengeance makes no bones about its discrepancies in historical accuracy, but several featurettes do look into the importance of history to the series and the painstaking efforts taken to make the look and feel of the show seem as if it is coming from the right time period. “Starz Studios - Spartacus: Vengeance” and the “Making of Spartacus: Vengeance” look at the little details that make a legendary slave rebellion come to life onscreen. To supplement these ideas further, “The Legend of Spartacus” paints a picture of the real figure of Spartacus and the Third Servile War. The Blu-ray set for Spartacus: Vengeance really had some effort put into it. Despite the gimmicky (but fittingly comic-oriented) menu page, the set comes with extended episodes that add and don’t detract from the content. Besides the aforementioned extras there are several other bonus features, including audio commentaries, bloopers, a directorial focus called “Behind the Camera: Directing the Rebellion,” and a “Famous Last Words” sequence, which contains interviews with the actors whose characters are killed off throughout the season. One of the biggest selling points for the series is that each season is almost entirely self-contained, which is impossible for most dramas to accomplish, but works in Spartacus both because the show cycles through characters and because the show is careful with its flashbacks. Vengeance might not be the subtlest or most surprising series on television, but it may be the boldest, and that certainly counts for a lot.